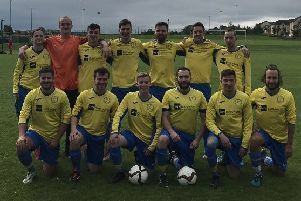 Newtongrange Star winger Ali Forster struck a double after coming off the bench to down Civil Service Strollers 4-2 after extra-time and then revealed he shouldn’t have even been playing. The New Victoria Park men deservedly went through to the fourth round of the SFA South Challenge Cup as they were far better than the holders and Lowland League visitors. Forster who returned to Star a year ago after a spell in Sweden playing professionally for BK Forward, was only on the bench to make up the numbers as he was carrying an injury. The 27-year-old sat out last weekend’s 3-1 win over Coldstream after injuring his ribs against Peebles Rovers the week before. He was back training on Tuesday night but had to be rushed to hospital after another body blow. “I got the nod to come on, but I wasn’t meant to be playing,” said Forster. “I got a bash in the ribs against Peebles two weeks ago and I didn’t play last Saturday. “I trained on Tuesday, I shouldn’t have really trained, I was still sore and I ended up getting it in the ribs again, so I ended up going to A&E on Tuesday night, but it’s got better since then. The cup tie went to extra-time after neither side could find a winner in 90 minutes, with Sean Melvin and Ross Guthrie both netting in the opening period. Forster felt Star should have been ahead at the interval as they had Civil penned in their own half for the opening 20 minutes with a lightning start, but couldn’t finish the opportunities that came their way. He continued: “We dominated the first half, and we should have put a few chances in the back of the net. It was one of those games where it was back and forth and we both missed chances. It took 31 minutes for Star to finally get the ball over the line, with Melvin quickest to react from Ryan Porteous’ knockdown from Dale O’Hara’s long throw. Former Edinburgh City man Guthrie put the visitors level, though, just five minutes later with their first shot on target. It was worth the wait, however, with his bullet low strike from 25 yards out finding the bottom corner. Star striker George Hunter had the best chances for either side in the second half as he twice went close. Forster would step up in extra-time to be the match winner, his first arriving on 96 minutes as he lashed home past goalkeeper Michael Lee, before Hunter had a tame shot cleared off the line by Hibs loanee Kevin Waugh. Star midfielder Dale Richardson played in Forster for their third, the wide man striding clear of right-back David Churchill before unleashing his shot at the near post. The visitors would pull a goal back almost immediately, but Hunter secured a terrific victory with an equally quality finish when he lobbed Lee after running free of their last defender. Three players saw red at the death after a touchline melee involving all 22 on the field marred a fantastic cup tie. Civil boss Gary Jardine refused to be drawn on the ugly scenes at the end, but admitted Star were worthy winners. He said: “Our boys competed well for the 90 minutes. We lacked a bit of quality but there was plenty of effort. “I thought Newtongrange were deserved winners after extra-time. Newtongrange Star: Renton, Sclater, Swaney, Mitchell, O’Hara, Scott (Forster), Melvin, Richardson, Thomson, Porteous (Currie), Hunter. Civil Service Strollers: Lee, Churchill, Mair, Guthrie (Ballantyne), Clapperton, Fee (Faye), McConnell (Bakar), Downie, Froude, Waugh, Muirhead (Hopkinson).